Steve opened Emerald City Gymnastics in July, 1996. The original location of Emerald City was at 87th and Farley in Overland Park and moved to the current location on Bond St. due to positive growth, in 2001. The idea behind opening his own gym was to establish a philosophy different from other gyms at the time. His dream was to keep gymnastics fun and foster an environment where kids felt good about themselves. As a lifelong gymnast, Steve has continued his love for the sport, as a coach, for the last 40 years. He graduated from Shawnee Mission Northwest High School and was the first person on the men’s gymnastics team at NW to qualify for State. 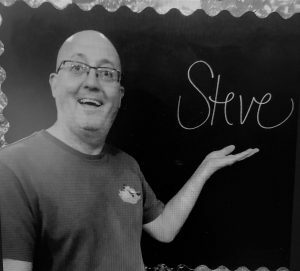 Steve pursued higher education at the University of Illinois – Urbana Champaign and earned a bachelor’s degree in Kinesiology. Steve served as the Kansas State Chairman for USA Men’s Gymnastics for 25 years and was on the board for USA Men’s Gymnastics Region 3 for 30 years. He coached at the Olympic Training Center for developmental summer camps and coached numerous state, regional and national qualifiers and champions. 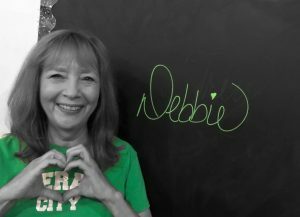 Debbie, also known as the ‘Director of First Impressions’ has been the face and welcoming smile of Emerald City for 17 years. Family and Emerald City is synonymous for Debbie as her daughter, Christen, was a gymnast with Emerald City, a team member from 1996-2003 and is now a weekend Supervisor. Debbie is a graduate of Shawnee Mission West and attended JCCC to study business. To contact Debbie, email debbie@emeraldcitygym.com. The ‘Director of Group Activities’ does not begin to describe Sean’s value to the Emerald City team. Sean began with Emerald City in the fall of 2001 as a birthday party and rock wall staff member. Over the years his talents expanded over coaching and maintenance as well. Although his role at Emerald City is all encompassing and rewarding, his love for music is Sean’s true passion. Not only does he perform solo shows singing and playing guitar, he has lead a band since 2003 and even fills in on shows for other bands. Sean’s work has been enjoyed by audiences at the Starlight in Kansas City, the Plaza Art Fair, local Kansas City casinos and weddings. Sean is a graduate of Shawnee Mission East and was accepted in to the Conservatory of Music at UMKC to pursue a music teaching degree. He later decided his love for performing outweighed his desire to teach. 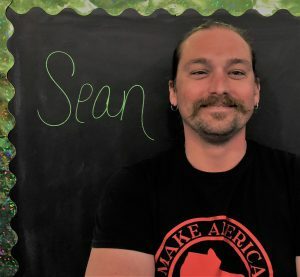 Emerald City is a great fit for Sean as he loves working with kids and his real life love is a gymnastics coach at EC. Sean has two cats, Bonnee and Blanche. He loves working at Emerald City “because little kids crack me up,” and he can utilize some of the same conversational skills with 3-year-olds as some of his late night audience members. To contact Sean, email Sean@emeraldcitygym.com. Nikki was welcomed to Emerald City family in March, 2018. She is primarily the compulsories coach for the 2018-19 season and brings 20 years of coaching experience to the team. Nikki also coaches girls recreational classes and is the Media Strategist for the gym managing the website and all social media. Before Emerald City, Nikki experienced coaching the Xcel team program for Region 3. Since relocating to Lenexa from Chicago, she has enjoyed getting to know her new Emerald City family and coaching so close to home. In the summer, 2017, she was accepted as a team coach for a week at FlipFest, an elite gymnastics training camp near Nashville, Tennessee, ran by Olympians John Roethlisberger and John Macready, coaching alongside Olympian and UCLA team member, Kyla Ross. FlipFest is an awesome, positive learning experience that she hopes to expose her own team kids to next summer. While attending the University of Colorado, Nikki coached recreational and pre-team girls gymnastics at Colorado Aerials from 2003-2006 in Colorado Springs. At her time with Colorado Aerials, she accompanied the boys team for two weeks to California (northeast of Los Angeles) to Camp Woodward, another premier elite summer gymnastics training camp ran by former Olympians. Besides learning from some of the best in our sport, Nikki was a gymnast until 17 years of age, when she decided to turn her love for the sport in to coaching. Nikki has 3 daughters, ages 22, 19 and 15. Besides coaching, she works part-time as a paralegal and hopes to attend law school someday. She earned a bachelor’s degree in Journalism from UMKC and master’s degree in Business Administration from MNU. Nikki has experience as a newspaper reporter and editing and cherishes her time studying abroad in Central Mexico at the Universidad de Guadalajara. She spends her small amount of spare time traveling with her daughters and seeing the world. 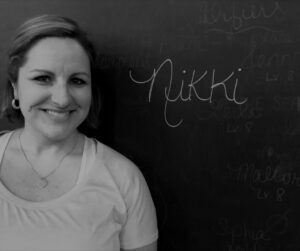 Nikki loves the family atmosphere at Emerald City and finding creative new ways to show recognition and appreciation for our team girls, team families and the entire EC staff to assist in the already inclusive, positive culture that is Emerald City. Nikki is First Aid/CPR/AED certified. To contact Nikki, email emeraldcityks.nikki@gmail.com. Jana has been with Emerald City for 7 years of her 20 plus years of coaching in the sport. She began coaching in her high school years, coached at a couple of clubs in Kansas City and even owned her own program before she settled in to her home here at Emerald City. Jana was a competitive gymnast as a child and was involved in competitive dance and diving as a teenager. Jana is a graduate from Shawnee Mission West and attended both Haskell Indian Nations University and JCCC. Patience and understanding for all types of personalities and the “love for finding alternate pathways to help a child overcome a challenge” is what Jana brings with her every day to work. While Jana is SafeSport certified through USA Gymnastics, she is most proud of her of ‘Stewards of Children’ certification through Aly Raisman’s ‘Flip the Switch’ campaign to help prevent childhood sexual abuse. 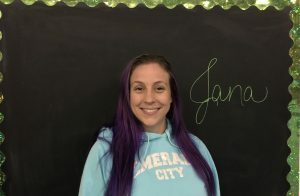 In the next 10 years, Jana sees herself right here at Emerald City. She hopes to continue her role in the growth of the gym, welcoming new families and teaching other coaches to love it just as much as she does. Jana also hopes to be able to travel and see the world. Currently, her free time is spent with her 2 kids, 2 dogs, 1 cat, 1 bearded dragon and competing roller derby for the Kansas City Roller Warriors. To contact Jana, email jana@emeraldcitygym.com. 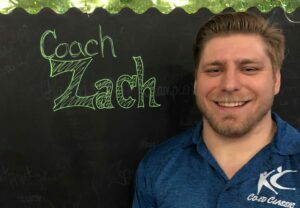 Coach Zach is another one of Emerald City’s lifelong gymnasts, starting at the age of 3. Zach joined the competitive team at age 7 and competed through his Senior year at Basehor-Linwood High School. Qualifying for the USAG Junior Olympic National Championship twice was a career highlight during his last four years as a Level 10 gymnast. He went on to be a cheerleader with the University of Kansas from 2012-2015. Zach began coaching at the age of 15 and loves to bring positive, fun vibes to the gym every day. He now coaches the boys team from which he originated.